Instead of riding a bicycle alongside traffic on congested roadways or adding to the air pollution problem in a car, now commuters can bypass the cars and utilize greener transportation alternatives, riding on elevated paths above the endless stream of automobiles. 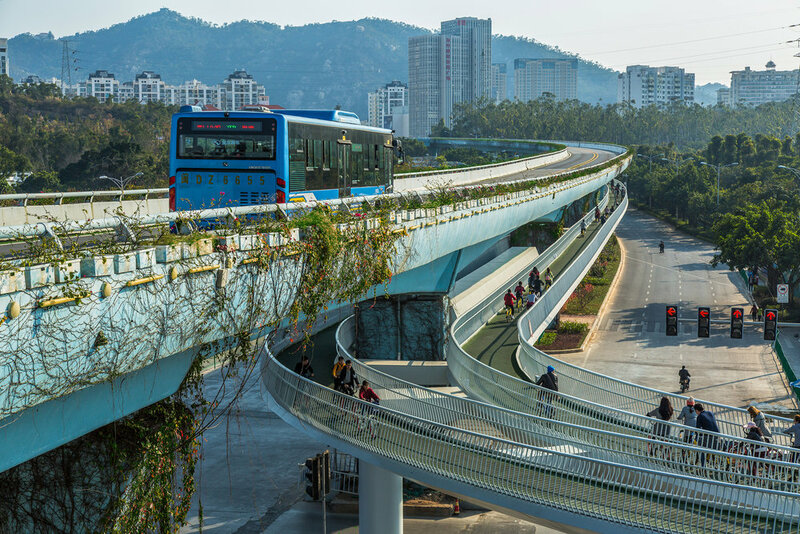 Earlier this month, the world’s longest elevated cycling path opened in China in an effort to alleviate transportation issues in Xiamen, China. Developed by Danish design firm Dissing + Weitling, the Xiamen Bicycle Skyway is 7.6 kilometers long, making it the longest elevated cycling path in the world. This isn’t the first time the firm has done a project involving cycling; they created the Bicycle Snake — a 230-meter cycling-only bridge in Copenhagen — in 2014. While the path in Xiamen will be elevated from the roadway, it isn’t totally isolated. There will be 13 points along the path that connect to other transportation systems; 11 of which correspond to bus stops on the Bus Rapid Transit route that runs on an elevated road parallel to the bike path. The path is certainly well equipped for cycling. It has 11 spiral ramps for continued riding, public bicycle stations that house 355 bikes, 253 parking spots across seven platforms, and 30,000 lights to ensure safe cycling at night. While the path was created for the promotion of cycling, it also caters to those on foot. There are several pedestrian lanes conveniently marked by a different color to avoid confusion or accidents with cyclists. Patrizia Panico is the first female to be head coach of a male national soccer team, with Italy's all-time leading goal scorer set to be on the bench for Italy's Under-16 team this week for a pair of friendlies against Germany on March 22 and 24.